Contenta Images2PDF - Muunna valokuvat PDF albumia. You are done. Your software is successfully registered! The free trial is limited to 30 days. 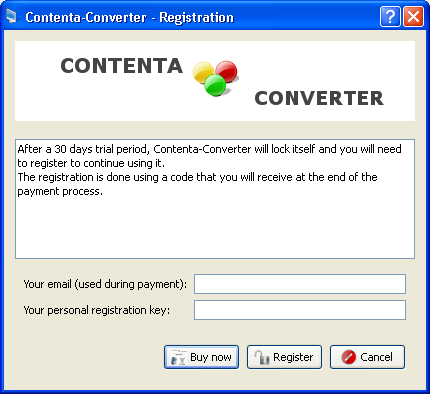 The images or documents generated by the trial version are watermarked. After payment, the time and watermark limitations are removed. Intel Mac Os X Yosemite, Maverick, Mountain Lion, Lion, Snow Leopard, Leopard (32 or 64 bit). On MacOsX, just move the application to the Trashcan. On Windows, just use the uninstaller program located in the installation folder or in the Control Panel->Add/Remove programs.